Metallica have announced a live radio show to be broadcast from their HQ on 4 September during which they will air new tracks and 'hang' with members of the Foo Fighters. 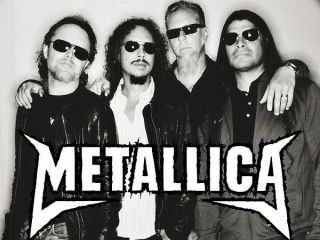 Fans tuning in to Metallica.com at 6pm PDT on 4 September (or 2am BST on 5 September) will hear the band play tracks from their eagerly-anticipated Death Magnetic album in advance of its 12 September release. There will also be some rather special guests in the studio in the shape of Dave Grohl and Taylor Hawkins. Speaking on Metallica.com, the band explained: "You may have heard a little something about a radio show being broadcast live from our very own HQ...well, we figured it would be a lot more fun if we invited some 'Tallica fans to come hang with us and low and behold, one thing led to another and Foo Fighters' Dave Grohl and Taylor Hawkins actually said yes!"